We have just released Email Archiver Pro 2.8.4 , Download Email Archiver Pro and it features some cumulative bug fixes as well as better support for 10.10. The Export button has been moved to a menu item under the edit menu. We are with some delays working on a new Email Archiver version 3, so please let us know what you need us to change! 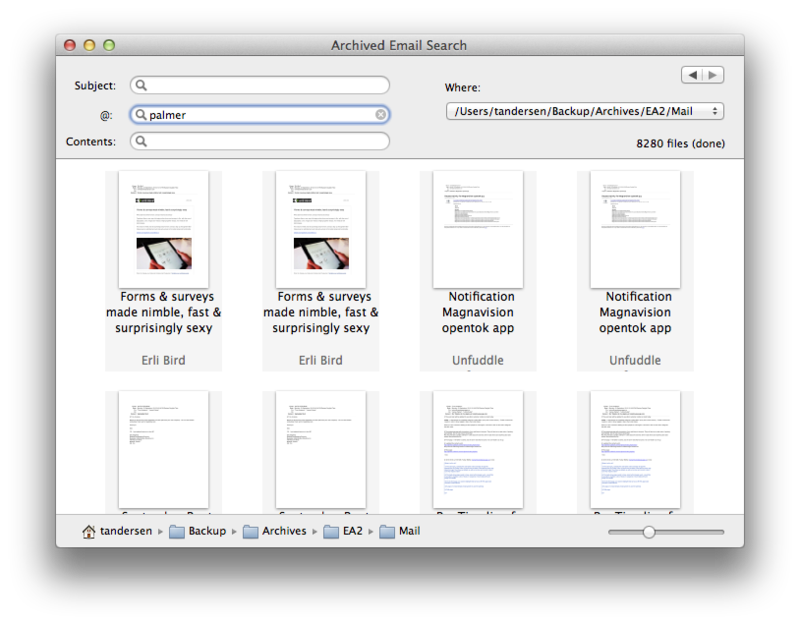 Personal: Use Email Archiver weekly to update a complete archive of your email. Then let Time Machine backup all the resulting PDFs, also perhaps using an offsite backup service to create a secure – time resistant backup of all your email. IT department: Periodically update users email. There are many ways to run Email Archiver in a LAN environment. You can run Email Archiver locally on each computer, creating the PDFs on the company AFP server. Feel free to contact support for details. Projects: Often a project, when finished needs to have all deliverables put on one DVD or FTP site. As a contractor you can archive all the emails for a single project in a few minutes, creating a lasting record of the development process. Legal: Discovery and client email backups and delivery – with Email Archiver a complete cross platform archival quality set of PDFs can be generated. Please email us with your use case (contact@spotdocuments.com).